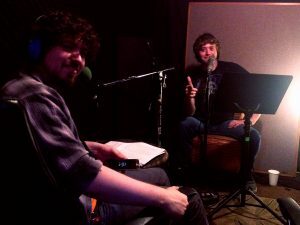 For Podcasters we offer a comfortable isolated room for up 3 participants to record their podcast. For more than 3 people we can move into our talent green room or into the main room and do a panel style recording with up to 8 separate vocal tracks. Upon finishing recording, clients can take home their raw wav files on a usb stick (client provides), or have them uploaded to a Google drive within 24 hours. The audio booth generally rents for $30/hr which includes the engineer. The comfort of the rest of the studio is available to all guests during this time. Discounts may apply to those who purchase multiple hours in advance. TECHNICAL: Removing noise, hiss, and buzz. Compressing the vocals and mixing. EDITS: Making any edits you the client want, like sections or lines taken out. This also includes adding intro/outro music and background music bed (radio station style). EDITORIAL: Low level editorial decisions to remove stutters, lip smacks, breaths and “ums”. Editorial can also include removing false starts and digressions in the story. Trimming out redundant details to make the show sound smooth and effortless, as if it were a script. TITLES: Adding intro/outro titles created in-house by us with your approval of style. ANIMATED BACKGROUND: Adding a looping animation to run through the video. There is a multitude of free to use animations we have collected to fit the style of most any podcast. THUMBNAIL: Additionally, we will create a suitable thumbnail to use with your upload that appeals to your target audience and helps capture as many clicks possible.